Bringing precision accuracy to a critical task like soil sampling is the goal of Allan Baucom. 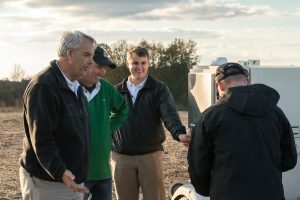 The North Carolina farmer developed the Falcon Automated Soil Sampling system a year ago after being frustrated with the inherent inaccuracy of traditional methods. With the introduction of two new models – the 1000 and 5000 – he is integrating a variety of technology components. The Model 1000 features an improved drum and funnel assembly for better soil mixing and sample integrity. An upgraded video camera enhances machine monitoring. A redesigned layout improves balance, aerodynamics, and ergonomics. The machine also includes an on-board computer with a remote, easy-to-use operator interface for control from the cab. The Falcon ServiceLink system supports remote diagnostics and software upgrades, plus a high-visibility caution light to quickly alert the operator if there is a malfunction. Along with the features above, the Model 5000 adds a dedicated GPS receiver to track sample routes and individual core locations, a barcode reader for sample integration with GPS locations, plus cloud-based data integration with soil test laboratories and precision ag software. Optional on the Model 1000, the 5000 is also equipped with an enhanced power/electronics/light package that includes a trickle charger, external PC ports, and improved lighting.